To remember the people lost to the devastating Black Saturday fires of 2009 and our brave CFA men and women who battled the elements to protect our towns, the Australian Blacksmiths Association (Victoria) Inc. invited blacksmiths from across the country and around the world to contribute to the creation of a steel gumtree. The Blacksmiths’ Tree, as it came to be called, was erected on February 14, 2014. Five years in the making, this 10m high stainless steel and copper tree was forged with love and care by hundreds of blacksmiths across 20 countries. It stands in the township of Strathewen to remember all of those who perished in the Black Saturday fires of 2009, those who fought the fires and those who continue to live their lives with hope and courage. 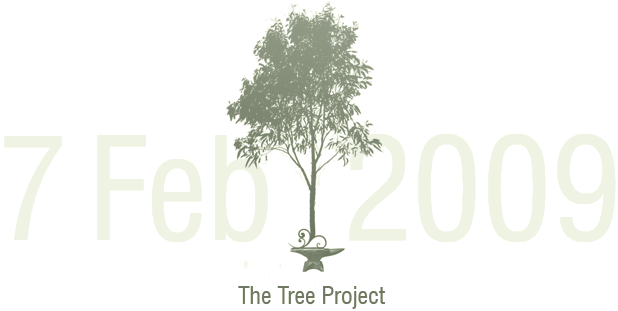 The official website for the The Blacksmiths Tree is www.treeproject.abavic.org.au. Please visit for further information about the tree and the Blacksmiths Association.